We are living in a time when things look pretty scary out in the world. Many people have lost hope, some of you may be in situations that look hopeless. Some of you may find yourself looking at your life asking yourself how you got where you are. I know I have been there - a few times. When I am praying, I sense the Holy Spirit saying that it's time to stir up hope. So, I have been on a study of hope, camped out in Romans 4 - such an amazing chapter about Abraham. Abraham hoped against hope. He dared to believe God that he would be the father of many nations when he didn't even have one child. That's some crazy hope right there. Hope is the joyful anticipation of something good. It is not passive but active. It is not wishy-washy but a strong and confident expectation. Bill Johnson says that it is the atmosphere that attracts the promises of God. When you have a word from God, that inspires hope. I want to be one of those who dares to trust God to do what only God can do!! What is it that you are facing that only God can change? Find a Scripture to stand on, to place your hope in and go for it. Our hope can't be in our job, our spouse or our circumstances looking just right. Our hope can only be built on God's Word. 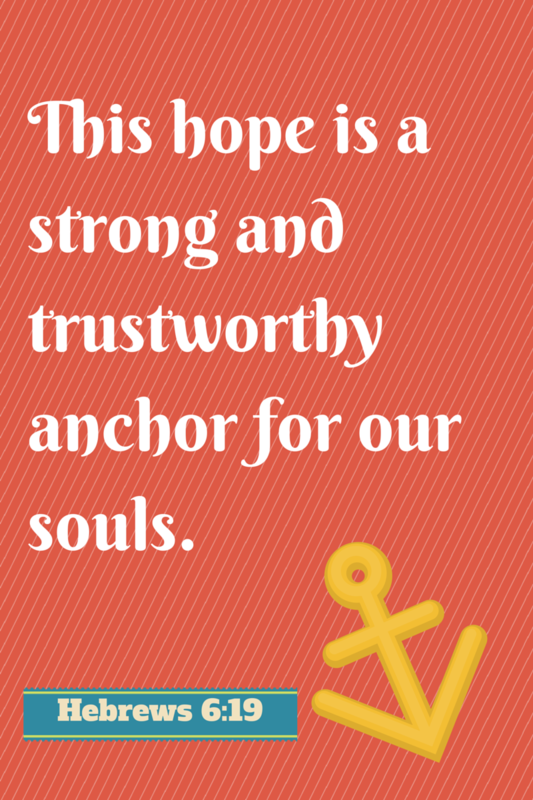 When your hope is in the Word of God, and things look scary, you have an anchor that keeps you settled.